I forgot to mention the frogging! Around Cape Trib I did a bit of walking around at night and managed to find another species new to me. There were heaps of White-lipped Treefrogs calling from the swampy creeks, as well as the odd Mottled Barred Frog (Mixophyes coggeri), Green-eyed Frog (Litoria serrata) and Stoney Creek Frog (Litoria wilcoxi). I heard a strange sound which, from a distance I thought was perhaps a flying fox complaining somewhere. When I realised it was coming from a creek, I ventured in and found a wood frog, Rana daemeli. 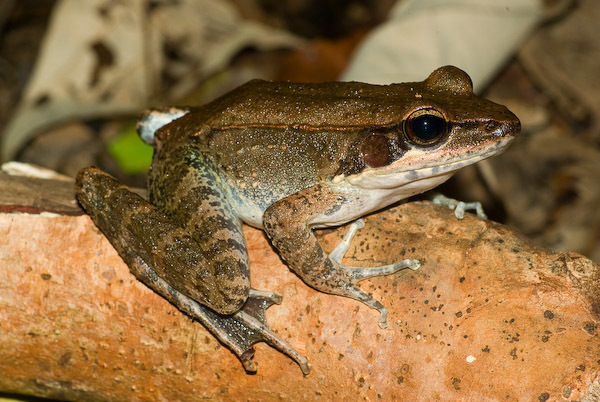 This species is the only one in the Ranid family (which includes the European edible frogs) in Australia - another recent migrant from the North. Apart from the frogs, the other thing of note was another nice Amethyst Python sliding off the boardwalk into the rainforest.